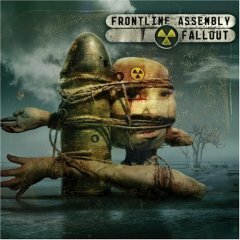 The majority of tracks placed on the most recent album of Front Line Assembly “FALLOUT” are remixed tracks from the previous album. Many of them are far more energetic and dancy than usual – to sum up – it seems to be perfect for a party. When you listen to “Beneath the Ruble” you simply can't stop from moving. Strengthened rhythm and a huge “power” will surely lead you to the dance floor. The same story is with “Social Enemy” in Jeremy Inkel’s version and “Unleashed” by Sebastian R. Komor. Drum and bass “Buried Alive” was also interpreted in an interesting way – the lighter version but still very pleasing. I don’t really like both versions of “Low Life” – they don’t appeal to me at all. I find the interpretation of “Humanity” the least interesting. I think this track has completely lost its magic and afterthought which summed up “Artificial Soldier”. Apart from the remixed tracks from the previous album , you will find three completely new songs on the CD. I’ll start with “Electric Dreams” which in my opinion is simply divine. Gentle, nice to listen to, but acute sounds and distorted vocal, characteristic for FLA make this track flowing and makes you want to return to it. “Civilization” and “Epitaph” fans will like it for sure. The next track is, in my opinion, also one of the best songs on the album. Dynamics, energy, strong guitar riffs and distorted vocal combined with German language make this track the most harsh on “Fallout”. During the chorus: …”eins! zwei! drei! LINKS!! !”… - there’s no way of avoiding the comparison with Rammstein “links 1234”. The last song is, as for me, the most monotonous and featureless from the three. In my opinion the only drawback of “Fallout” is the total lack of atmosphere. The most of FLA albums are one of the kind. Gentle “Civilization”, when I’m listening to which I’m melting away, mysterious “Epitaph”, “Implode”, dark “Corroded Disorder”, cyber- space “Caustic Grip”, rock-industrial “Millenium” and so on… each of them is unique and special. “Fallout”, as a compilation, is not “a whole”, it doesn’t have am individual specific atmosphere achieved skillfully on “Vanished” for example. As for me , it's a new version of “Artificial Soldier”. A new, excellent version of course. I’m waiting impatiently for the new, full-length album and I’m curious which direction FLA will go to.